Illustration of Indian activist Gauri Lankesh by Carol Rossetti. 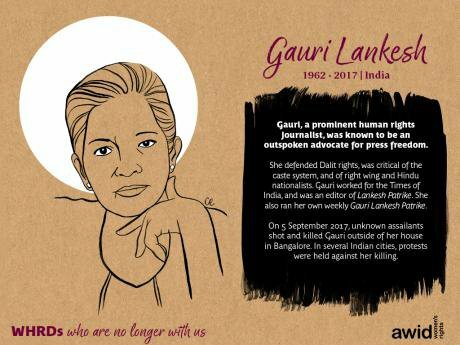 Image: courtesy of AWID.I work for a women's rights organisation that publishes annual online tributes to activists who have died or disappeared over the year. We compile epitaphs based on testimonies from loved ones, communities, and institutions that were close to these activists. We collect their images, illustrating and stylising the tributes for visual impact. Greed and patriarchal violence constantly threaten the lives and well-being of too many women and nonbinary folks, particularly from the Global South, and from Black, queer, trans, people of colour, and indigenous communities. This year alone, over half of the 72 activists (62.5%) commemorated in our tributes were killed or disappeared, some under ‘suspicious circumstances,' others amid overt and targeted violence. A pattern emerges from these stories. I think of Elise Ama Esso, a women’s rights activist whose lifetime of human rights work in Togo far outweighs any possible memorial; Patricia Villamil Perdomo from Honduras, who defended migrants’ rights, even against the threat of drug cartels; and Gauri Lankesh from India, whose writing defended the rights of Dalit people and denounced the caste system. My team has pored over the biographies of these activists, examining, on some days, eight or more of their stories at a time. The online exhibit we have curated is a repository of lives, memories, and life-changing labour. Brief records of big legacies. I have made it a habit to light a candle while reading about them, though the gesture feels too small. The online exhibit we have curated is a repository of lives, memories, and life-changing labour. Brief records of big legacies. I'm also reminded of what Haitian-American writer Edwige Danticat said about Audre Lorde’s reflection on mortality during her fight with breast cancer. Among other things, Danticat observed that the Black queer feminist refused to reduce her own story to one of loss. It would be absurd to limit our interest in Lorde to stories of her death. This would diminish her emotional and intellectual legacy, and most importantly, her humanity. The same applies to the activists we have lost. On the other hand, mourning is an act of healing. And for those close to the deceased, through personal connection or shared identity, it’s a difficult process that speaks to the human cost of liberation. It’s a horrific business to count the dead, especially when too many of the activists we have lost die because of their activism and their gender, defense of territory, natural resources and basic human rights. States have a responsibility to respect, protect and create an enabling environment for women human rights defenders everywhere. On this, too many are currently failing. During this year’s 16 days of activism against gender-based violence, please join others all over the world in remembering activists who have given so much to our movements, and call on your governments to guarantee the safety of defenders everywhere. Visit the online tribute to women human rights defenders, and share your stories of activists who are no longer with us.